Based on Columbia Pictures? blockbuster film, Men In Black, the animated series chronicles the further adventures of agents Jay and Kay. Along with their colleagues, Zed and Elle, they provide intergalactic, top-secret security services to guard the earth from extraterrestrial evil-doers. With firepower and attitude to burn, agents Jay and Kay pursue their mission to protect the earth from the scum of the universe. Season 1 Volume 1: T..
Based on Columbia Pictures' blockbuster film, Men In Black, the animated series chronicles the further adventures of agents Jay and Kay. Along with their colleagues, Zed and Elle, they provide intergalactic, top-secret security services to guard the earth from extraterrestrial evil-doers. With firepower and attitude to burn, they pursue their mission to protect the Earth from the scum of the universe. Season 1 Volume 2 Episodes: The Fa..
Men In Black Men In Black follows the exploits of Agents K (Jones) and J (Smith), members of a top-secret organisation established to monitor alien activity on Earth. The two MIB find themselves in the middle of a deadly plot by an intergalactic terrorist (Vincent D'Onofrio) who has arrived on Earth to assassinate two ambassadors from opposing galaxies. K and J face a simple imperative: track down the interloper or the Earth will be des..
Mib 1-3 Repackage DVD Special Features Men In Black, Deleted Scenes, Metamorphosis Of Men In Black, Documentary, Plus Many More Intergalactic Features, Men In Black 2, 'The Chubb Chubbs' Short Film, Men In Black Training Video, Commentary With Director Barry Sonnefeld, Black 3, Partners In Time: The Making Of MIB, Gag Reel, 'Back In Time' Music Video By Pitbull,..
Own Men In Black / Men In Black II DVD from Deff, DVD, Blu-Ray & 4K Video Specialists - Free UK Delivery.. In Men in Black 3, Agents J [Will Smith] and K [Tommy Lee Jones] are back... in time. J has seen some inexplicable things in his 15 years with the Men in Black, but nothing, not even aliens, perplexes him as much as his wry, reticent partner. But when K's life and the fate of the planet are put at stake, Agent J will have to travel back in time to put things right. J discovers that there are secrets to the universe that K never told him.. In Men in Black 3, Agents J (Will Smith) and K (Tommy Lee Jones) are back... in time. J has seen some inexplicable things in his 15 years with the Men in Black, but nothing, not even aliens, perplexes him as much as his wry, reticent partner. But when K's life and the fate of the planet are put at stake, Agent J will have to travel back in time to put things right. J discovers that there are secrets to the universe that K never told him.. In Men in Black 3, Agents J (Will Smith) and K (Tommy Lee Jones) are back... in time. J has seen some inexplicable things in his 15 years with the Men in Black, but nothing, not even aliens, perplexes him as much as his wry, reticent partner. But when K’s life and the fate of the planet are put at stake, Agent J will have to travel back in time to put things right. 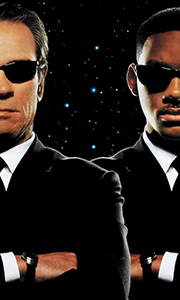 J discovers that there are secrets to the universe that K never told him..
Men In Black follows the exploits of Agents K (Jones) and J (Smith), members of a top-secret organisation established to monitor alien activity on Earth. The two MIB find themselves in the middle of a deadly plot by an intergalactic terrorist (Vincent D'Onofrio) who has arrived on Earth to assassinate two ambassadors from opposing galaxies. K and J face a simple imperative: track down the interloper or the Earth will be destroyed. It's .. Agent Jay (Will Smith) and Agent Kay (Tommy Lee Jones) are turning up the heat on alien terrorists in the biggest sci-fi comedy hit in the galaxy. Go behind the scenes of Men In Black and experience a universe of special features exclusive to this collectible DVD! Special Features Digitally Mastered Audio & Anamorphic Video Supervised By Director Barry Sonnenfeld, Visual Commentary Featuring Barry Sonnenfeld & Tommy Lee Jones With On-S..
Tommy Lee Jones and Will Smith are back in black as the scum-fighting super-agents Kay and Jay - regulators of all things alien on planet earth. Their latest mission: to save the world from a total intergalactic disaster! When a renegade Kylothian monster disguised as a lingerie model threatens the survival of the human race, the boys of the MIB get the call to step up and get busy. With their headquarters under siege and time running o.. Triple bill of sci-fi features starring Will Smith and Tommy Lee Jones as a pair of agents tasked with keeping extraterrestrial inhabitants of Earth in check. In 'Men in Black' (1997) New York cop James Edwards (Smith) finds himself recruited to the secret MiB agency, where he is partnered with K (Jones) and sent to investigate an alien prediction of the end of the world. Initially, the partnership doesn't gel, but with fearsome alien a..